Nuclear pore abnormalities may be widespread in neurons affected by ALS and FTD. 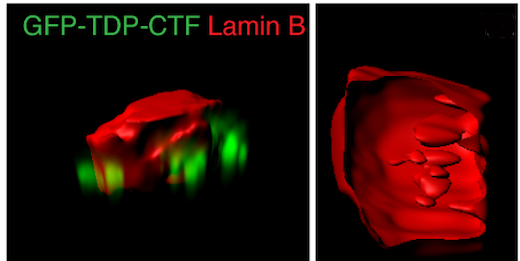 In a primary cortical neuron, green shows aggregation-prone TDP-43 and red shows the resulting distortion of nuclear structure. Used by permission from Wilfried Rossoll/Nature Neuroscience. The results were published online on Monday in Nature Neuroscience. ALS researchers had already identified nuclear transport problems in the most common inherited form of the neurodegenerative disease, caused by mutations in the gene C9orf72. Just a minority of ALS cases can be blamed on inherited mutations; most are sporadic, thought to come from a combination of genetic and environmental factors. The findings suggest that a drug strategy aimed at easing the traffic jam may be generalizable to sporadic and at least some familial types of ALS. "TDP43 pathology is seen in about 98 percent of ALS cases and about 50 percent of FTD cases, and our work supports the now-accepted conclusion that nucleopore abnormalities are not restricted to C9orf72 expansion mutations," Glass says. "Confirming the in vitro data in human brain tissue was very important, making the findings that much more relevant." He adds that there is still a chicken-or-egg question surrounding TDP-43 aggregation and nuclear pore abnormalities.